A Pawn which has no Pawn of the same color on either of its adjacent files. 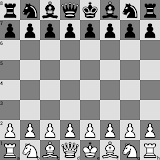 Due to the fact that, first, an "isolated Pawn" is deprived of the potential support which united Pawns can offer to each other, and second, that it must be guarded by a major or minor piece, it is generally considered to be a disadvantage to its owner. An "isolated Pawn" is frequently referred to as an "isolani".